He Restoreth My Soul [G7226] - $16.00 : Yarn Tree, Your wholesale source for cross stitch supplies. Cross stitch pattern by Victorian Rose Needlearts. 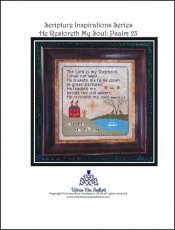 "He Restoreth My Soul," is an original sampler and is based on the beloved Scripture passage found in Psalm 23. Sheep were very important in the nomadic life of the early Hebrews & symbolize innocence, meekness, and gentleness. Psalm 23: 1-3 "The Lord is my Shepherd; I shall not want. He m aketh me to lie down in green pastures: He leadeth me beside the still waters. He restoreth my soul," is stitched on this design. Stitch count 179w x 183h.